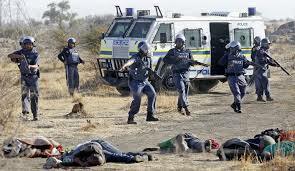 As the Farlam Inquiry into the August 2012 Marikana Massacre hears final statements, commentators are analysing what went on and who is to blame. Here is a selection of recent coverage. Political pressure, NUM officials shooting at protesters and the firing of teargas and stun-grenades are to blame, says advocate Dali Mpofu. Deputy President Cyril Ramaphosa is accused number one, according to Dali Mpofu. For the commissioners, however, finding Cyril caused the massacre might be a leap too far as lawyers are still trying to convince them the police killed real people and not a faceless mob programmed by muti to attack cops. During the hearings of the Marikana Commission, Lonmin executives said the company had not been able to afford to keep its 2006 promise to build 5,500 new houses for workers. Yet a year later, in 2007, the International Finance Corporation had made finance of US$150 million available to Lonmin – part of it for a “large-scale community development programme”. At the commission of inquiry into the Marikana massacre, the email correspondence between Cyril Ramaphosa, then a nonexecutive member of the Lonmin board, and other members of Lonmin management has received considerable attention.